Very pleased to welcome a blogger today who has come up with a fabulous name for her blog. Becca blogs at If Only I Could Read Faster – something lots of us book bloggers wish I think! Thanks for agreeing to be part of my Blogger in the Spotlight feature Becca. First of all, would you tell me a little about yourself? Thanks for having me! I’m 39, although by the time you read this I will probably be 40. I have two wonderful children, five year old twins. I’ve done various jobs in my time, but I’ve always had a job working with either people or animals. I’m dyslexic and as a child reading was difficult, but although I’m slow I’ve always enjoyed it. I’m currently helping to teach my children to read which is challenging but I so so so hope that they both grow up to love books too. Having dyslexia meant that reading was difficult for me as a child, I loved it but struggled until my teens when it got a bit easier and more enjoyable. The main books I remember reading were Judy Blume and then Virginia Andrews Flowers in the Attic series. 2015 was an incredibly difficult year for me, there was so much going on and it really did feel as though books were the only thing that I had to escape. Being able to pop online and dip into the book related facebook groups was so important, it gave me a break from everything else going on. During the most difficult times I struggled to read books, I gave up on many books that just didn’t grab me but looking back I’m sure that it was me and not them. But the more time I spent in the book community the more I came to know authors and the incredibly hard work that it took to write a book and get it published. I saw how reviews of their books helped them in so many ways and how many book bloggers were able to help promote authors and raise their profile. I also had quite a few friends that would regularly ask me to recommend them a book and I figured if I had a blog I could just send them that way! I’d actually wanted to start a blog for about six months but I couldn’t think of a name! Hard question as I’m enjoying so much about it!! I really thought that no one would read my blog, maybe a couple of friends would look now and then when they wanted a book to read, so it amazes me when I see how many people are reading it every day. I think that the best bit though is when you get feedback, someone who read a book on your recommendation and enjoyed it, I love that feeling. There’s also a great community of book bloggers, being such a newbie I’m not part of it yet, but hopefully as time goes on I will be and I’ve already found some other bloggers to be so supportive. Oh and I love it when an author responds to me on twitter or facebook! This is such a hard question!!! I hope that my blog is interesting and easy for people to follow, I’m not the fastest reader (hence the name) so it isn’t updated too often. I hope that it is a blog where people who also love books came get ideas for what to read and find out more about authors that they like (I have a few author events coming up). It’s April 2016 and I just finished When She Was Bad by Tammy Cohen and so tonight I will start In Too deep by Samantha Hayes, I have been sent it in paperback to read so that will be a bit strange! I’m just adding to this as I’m now reading Angela Marsons Play Dead which I just got a copy of it on Netgalley. I never normally stop a book that I’ve started to read something else and go back to it but I couldn’t wait to finish In Too Deep to read Play Dead so that’s what I’ve done! I love my Kindle! I was really unsure about getting one at first but I haven’t looked back and now I rarely read a book. I used to read only at bedtime, with two young children there wasn’t any opportunity in the day to read, but as they’ve got older reading has become a daytime activity too! Most days after I take them to school I come home and read my kindle for a bit, then if I’m going out and there’s any chance that I might have to wait somewhere then my kindle comes too. I love reading in bed though, especially with my electric blanket on in the winter! I’d spend all day in bed sleeping and reading if I could! Thinking about this question I realise that most of the characters in books that I read go through some sort of tragedy or difficult situation! I have no desire to be a police officer so that rules out most of the characters. 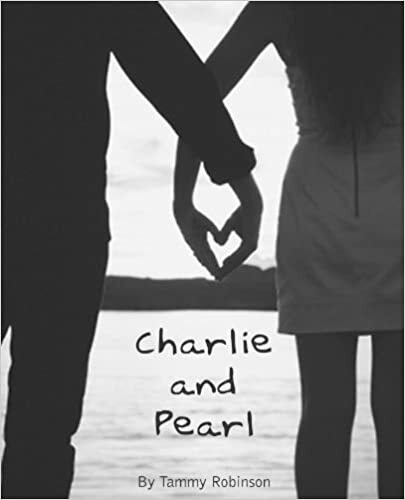 I can’t help thinking of Charlie and Pearl by Tammy Robinson, I guess that I’d like to be Pearl while she is with Charlie, so not the rest of her life but for that bit that we read about. Although such a wonderful story it isn’t exactly a happy book either! Thank you so much to Portobello Book Blog for having me as their blogger in the spotlight today. Great post and a blogger who is slightly different to the norm – heartening to hear that after an initial struggle Becca has found so many books to enjoy. Great blog too!